So, my thought was: Since it's the temperature that counts rather than the time, I can keep the temperature at 64-65 °C, and the egg will be perfect (to my taste) no matter how long they are cooked: a fool proof method to eggs with tender solid white and soft yolk! 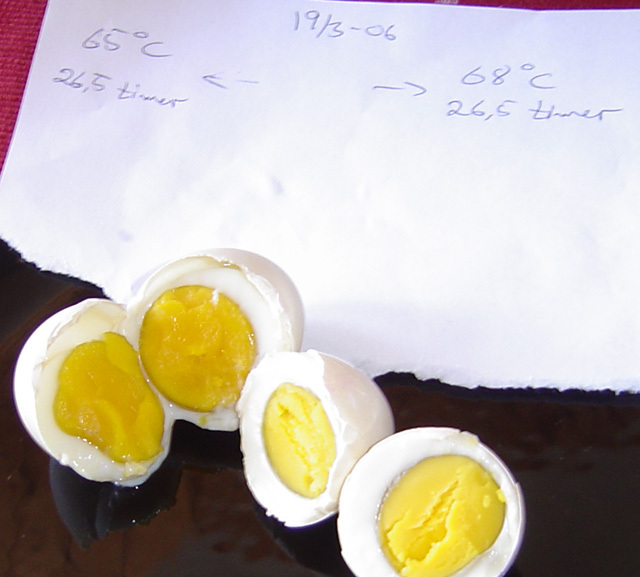 The pictures show eggs cooked ad 65 and 68 °C for 6 and 26.5 hours, respectively. The proof is in the pudding, so I tried cooking an egg at 65 °C exactly for an hour or more, and was to put it mildly surprised. The egg came out with a runny white but firm yolk!! These come out the same whether they're kept for half an hour (to ensure the same temperature throughout the egg) or 26 °C hours. Another proof, provided the temperature is right, for that the time doesn’t matter in coagulating proteins. There may be several reasons for this, but one is found in McGee (pp 85): "[…]the major [egg white] protein, ovalbumin, doesn't coagulate until about 80 °C". So, it seems, this time chemistry played me a trick. 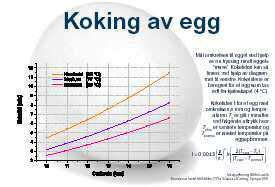 We will still have to rely on physics: the reason that we can have eggs with firm white and soft yolk is, when using a temperature well above the coagulation temperature, that the white is "overheated" before the temperature of the yolk passes the point where the yolk stiffens. There is, by the way, a mathematic model/equation for this. Have a look at Martin Lersch's web site on Kitchen chemistry for a nice diagram and explanation of this. Martin Lersch's page "Molecular gastronomy and the science of cooking"
'Cooking' an egg [62 gram, 21 °C] in cooling water [1000 gram, 76 (82) °C] gives the same result [more or less]. do you mean 26 hours instead of 26 degrees C? Thanks for the correction. It's of course supposed to be hours. for me, a firm yolk with soft white is the perfect soft boiled eggs which my mum used to do when i was growing up.